In celebration of the NFL’s release of the all-22 and end-zone film for the 2012 season, each week we’ll be bringing you the best in offensive- and defensive-line play. For the winners of last week’s Trenchie’s, click here. For about 15 years, many of the NFL’s best running attacks had one thing in common. It wasn’t a punishing back, or a huge, mauling set of guys up front, although those things often help. No, it was just one guy, a North Carolina–born assistant coach with a penchant for four-letter words and an unrelenting demand on the men he coached. Alex Gibbs was never a head coach. He was never even an offensive coordinator. But he’s done more for football than many who’ve been either. Gibbs’s zone-blocking scheme took hold in Denver in the mid-to-late ’90s, and it’s proliferated from there. After a couple years spent turning the Falcons into the best running team in the league, Gibbs rejoined Gary Kubiak when the former Broncos’ offensive coordinator got the head job in Houston. It’s been three years since Gibbs left the Texans, but his principles are what have made Houston the best running team in football. 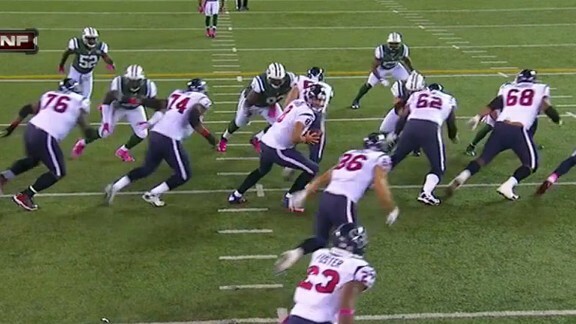 This is a play from the second quarter of last week’s Monday Night Football game. As Jon Gruden explained in the initial replay of Arian Foster’s 21-yard gain, the Jets are lined up in the 46 defense made famous by Rex Ryan’s father, Buddy, when he was the defensive coordinator of the 1985 Bears. To go with their three interior down linemen, the Jets have strong safety LaRon Landry manned up over the tight end, two linebackers to the outside, and two on the inside. The play called is an outside zone lead, with the line zone blocking to the right and fullback/tight end/nuclear physicist/theoretical philosopher but above all, a man James Casey lined up in front of Arian Foster and set to lead up on the play-side linebacker. Nearly every one of the assignments for Houston’s offensive line is a tough one here. Everyone but the center has a primary responsibility to his play side. Nothing much to say here other than this is how it’s supposed to look. The key to an effective zone scheme is synchronicity and consistency, and the former is represented well in this image. Note the distance that left guard Wade Smith has to go to get the nose tackle. That distance makes this block all the more impressive. Smith, highlighted in blue, has gone a full three yards to cut the nose here. He gets some help from center Chris Myers, who does exactly what he needs to — work up to the second level without the nose tackle crossing his face to the play side. That little bump as he moves past allows Smith to catch up for the cut. 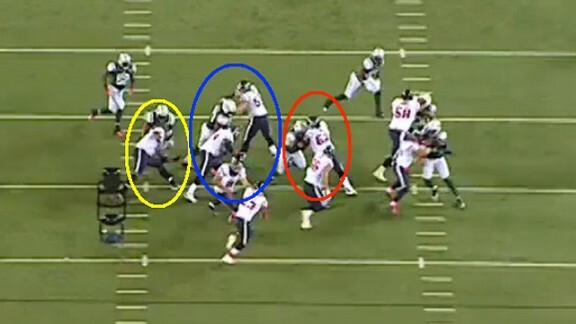 It’s a great effort, but the best block on the play goes to right guard Antoine Caldwell, highlighted in red. As shown in the first photo, Caldwell’s assignment is lined up on his outside shoulder, and without any help, he manages to not only reach the defensive lineman but turn him completely to the inside. Casey now has a lane through which to lead up on the linebacker. Casey, highlighted in yellow, sneaks between Caldwell and tight end Owen Daniels to make solid contact on Bart Scott in the hole. With that block, all seven of the Jets’ in-the-box defenders are accounted for, and Foster goes untouched up the right sideline. As Gruden noted, this is a front that, in theory, should be effective against the run. At a disadvantage at almost every position before the snap, the Texans soundly won every individual battle on the play, and when that happens, it usually leads to 20-yard chunks that look infinitely easier than they are. 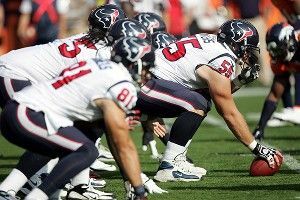 One more zone-blocking nerd note about the Texans from Monday night: Houston is the best play-action team in football, and as much as that might be a result of other teams “honoring the run,” the truth is that play-action efficiency is often the result of great acting by the guys up front. On zone-blocking play fakes, the goal is for every movement by the offensive line to look the same as it would on the run they’re mimicking. Above is the start of Houston’s first touchdown. 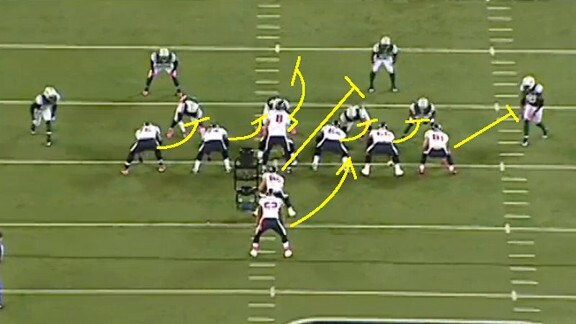 The in-line formation is the same, with a tight end to the play side and Casey lined up in the backfield. Everyone in white sells this as an outside zone run to the right, starting with the line’s first steps. The difference here is that Owen Daniels is on the backside running a double move down the middle of the field, and rather than hand the ball off to Justin Forsett, Matt Schaub is going to bootleg back out to the left and throw one of the easier touchdown passes he’ll ever get. The takeaway here is pretty simple — this stuff looks pretty when done right, and nobody does it right more often than the Texans. There’s something of a defensive renaissance going on in St. Louis, and although the play of the Rams’ shiny new cornerbacks deserves its due, the resources devoted to the defensive line have played a large part. Chris was one of the two Longs taken before Darren McFadden in the 2008 draft, and as Jake has in Miami, he’s developed into one of the league’s best players at his position. He’s also seriously stepped up his tattoo game. To go along with Long, St. Louis drafted sort–of–North Carolina–prospect Robert Quinn in the first round last year. The Rams thought enough of Quinn’s talent that they were willing to overlook his missing a year of football after being ruled ineligible by the NCAA for taking gifts that likely cost far less than the market value for his services. Anyway, last Thursday those two got a crack at the turnstiles known as the Cardinals’ offensive tackles, and the results were predictably bad for anyone who loves Kevin Kolb. Anyone who watched the NFL Network broadcast likely needs no more explanation than the one given by the incomparable Mike Mayock, but here’s my best shot. 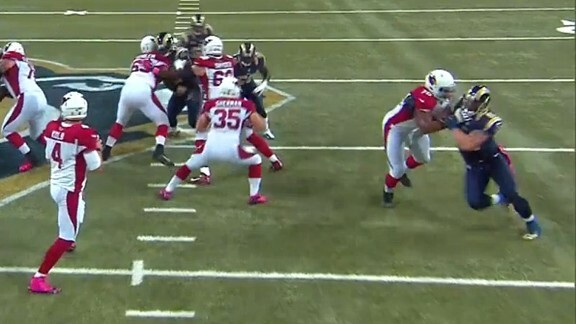 Both of Arizona’s tackles have struggled with speed rushers, and both the Rams’ ends happen to be very, very fast. 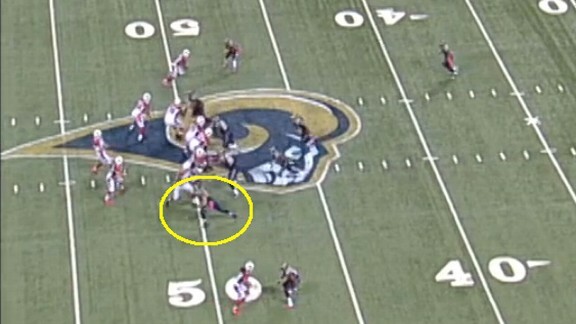 The photo above is of the snap on Chris Long’s second-quarter sack. Sorry about the blur, but then again, that’s the point. 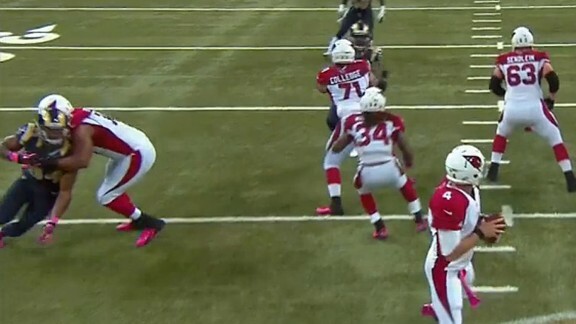 As the ball hits Kolb’s hands, Long is already two yards into the backfield. 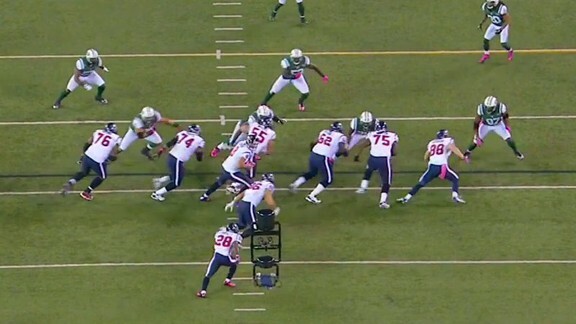 For right tackle Bobby Massie, this is a problem. He’s barely into his pass set before Long is on him. When Long gets to Massie’s edge, which happens quickly, he instantly drops his inside shoulder, and that does it. 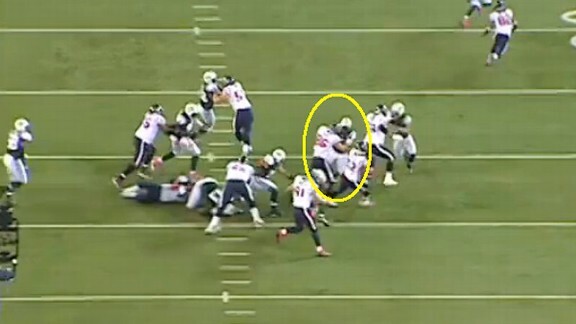 With a step and leverage, Long bends back toward the quarterback, and the play ends with Kolb on the ground. Quinn’s first sack is more of the same. Along with beating D’Anthony Batiste to the edge, he gives the 6-foot-4 tackle very little of his body to latch on to. Quinn is about as low as he can go, to the point where he actually crawled the final yard before dragging Kolb to the turf. The ineptitude of Arizona’s offensive line certainly helps, but last Thursday night must have looked a lot like what St. Louis envisioned when they took Quinn last spring.